Geologic, geophysical, and geochemical studies evaluate mineral endowment in selected regions of the United States. The USGS Mineral Resources Program (MRP) delivers unbiased science and information to increase understanding of ore formation, undiscovered mineral resource potential, production, consumption, and how minerals interact with the environment. MRP supports data collection and research on a wide variety of non-fuel mineral resources that are important to the Nation’s economic and national security. Statistics and information on minerals and materials essential to the U.S. economy, the national security, and the flow of materials through production, supply chains, recycling and sustainability. Interactive maps and downloadable data for regional and global geology, geochemistry, geophysics, and mineral resources. We study geologic processes that concentrate known mineral resources at specific localities in the Earth's crust, and assess quantities, qualities, and areas of undiscovered mineral resources, or potential future supply. 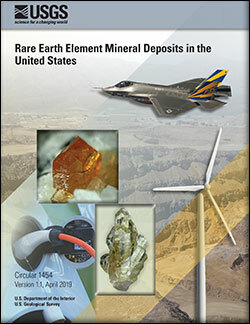 Van Gosen, B.S., Verplanck, P.L., and Emsbo, Poul, 2019, Rare earth element mineral deposits in the United States (ver 1.1, April 15, 2019): U.S. Geological Survey Circular 1454, 16 p., https://doi.org/10.3133/cir1454. Hammarstrom, Jane M.; Dicken, Connie L.
Hammarstrom, J.H., and Dicken, C.L., 2019, Focus areas for data acquisition for potential domestic sources of critical minerals—Rare earth elements, chap. A of U.S. Geological Survey, Focus areas for data acquisition for potential domestic sources of critical minerals: U.S. Geological Survey Open-File Report 2019–1023, 11 p., https://doi.org/10.3133/ofr20191023A. 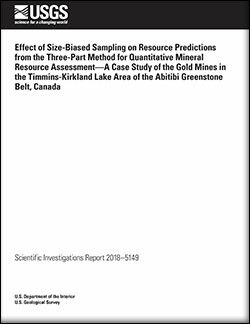 Ellefsen, K.J., 2019, Effect of size-biased sampling on resource predictions from the three-part method for quantita-tive mineral resource assessment—A case study of the gold mines in the Timmins-Kirkland Lake area of the Abitibi greenstone belt, Canada: U.S. Geological Scientific Investigations Report 2018–5149, 15 p., https://doi.org/10.3133/sir20185149.